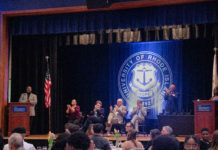 One hundred and forty-six professors and counting have been placed on a national “watch list” over the past month for expressing liberal ideals, and the University of Rhode Island is represented among those numbers. The Professor Watchlist featured Assistant Professor and Acting Director of Graduate Studies Erik Loomis for making negative comments against the National Rifle Association in 2012 on his personal Twitter page. After the attack at Sandy Hook Elementary School, Loomis made his disdain for the NRA known when gun reform did not follow the tragedy. Although his comments may have been upsetting to some, Loomis said he has never expressed his own personal opinions in front of the classroom. According to Turning Point USA, which backs the Professor Watchlist project, the list is meant to “expose and document college professors who discriminate against conservative students and advance leftist propaganda in the classroom.” This is nothing of which Loomis feels guilty. Attempts to silence the free speech of college professors is nothing new in this country, according to URI’s Executive Director of the American Association of University Professors, Jay Walsh. Dating back to more than 40 years ago, Lewis Powell Jr. released the Powell Memo to corporations around the country, urging against social justice movements and centering his attack against universities and professors. Given this, Walsh said he is not surprised that such a list exists today. Turning Point USA advertises that they want to “continue to fight for free speech and the right for professors to say whatever they wish,” but Loomis said this statement is “ridiculous,” and that the list is impeding First Amendment Rights of professors. He equates the actions of Turning Point USA as being similar to intimidation tactics used by McCarthyism in the 1950’s and the Red Scare before and after WWI. The non-profit organization feels that “students, parents and alumni deserve to know the specific incidents and names of professors that advance a radical agenda in lecture halls,” but Loomis considers Turning Point USA as the radical ones. Although the Professor Watchlist is always accepting tips, the only way to be featured on the list is to have already been part of a pre-existing news story. The Professor Watchlist aggregates from a variety of news sources, but Loomis stressed the importance of reliable and objective reporting. The article associated with Loomis was published with Campus Reform, an online publication meant to serve as a watchdog to our nation’s higher education system and works to “report on the conduct and misconduct of university administration, faculty, and students.” Campus Reform, however, is a project of the Leadership Institute. Since being singled out by these groups, Loomis does not appreciate the attention, but says he is proud to have been targeted by those he feels are acting as fascists. As far as intimidation goes, Loomis said he will not be intimidated out of exercising his First Amendment rights outside the classroom, just like every other citizen. “If these people are targeting you, it probably means that you’re doing something right,” Loomis said. Outside of the university, Loomis has a strong social media presence with a Twitter following of more than 4,000, a well-read blog, and various publications in journals concerning politics. He considers all of these things to be influenced by his teachings and expertise in his fields, but that ultimately these things are separate. “Anything I may have said or continue to say about the National Rife Association, or anything else, is irrelevant unless I say this in a classroom,” Loomis said. Loomis did not face any disciplinary action for his personal comments outside the classroom four years ago, according to Walsh, and he will not face any now that he’s been listed by a third-party. In his field, Loomis is an expert on labor unions, inequality, globalization, and environmentalism – gun control is outside of this, but it’s a political issue he feels strongly about. The death of his high school Spanish teacher, who was shot and killed by her son in 1998, has been a huge influence on his position. After killing his mother, Faith Kinkel, the night before, Kip Kinkel then brought a gun to Thurston High School in Oregon where he killed two students and injured another 25. Walsh strongly agrees with Loomis’s rights to voice his opinions outside the classroom, and that any hindrance on the rights of other hurts all of us.